The week tends to be really busy for me. Often, I leave for work as the sun is rising and get home just as it is setting. Not bad, just the reality, especially during Daylight Saving Time. Don is responsible for cooking our dinners during the week, I'm not complaining, because WOW, he makes some delicious stuff! But the weekends...they are all mine! On Saturday, we had picked up our basket from Bountiful Baskets and already I went to town meal planning. 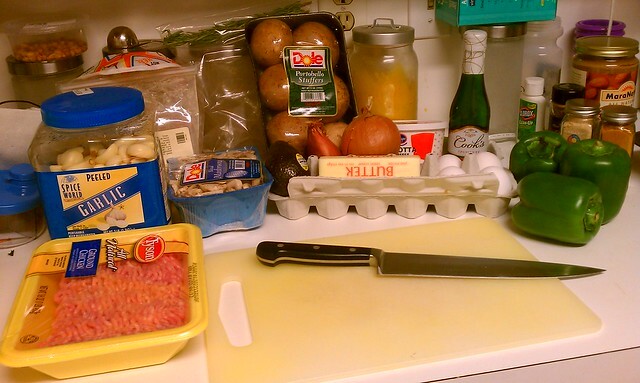 That afternoon, we hit up the grocery store to pick up supplies, and that evening, I whipped up some goodies. I also, busted out both mixers and made a batch of chocolate fudge cupcakes with store bought icing (the horror!!). It was an easy test run to see if I was able to make Mari's cupcakes for her birthday, which I can totally do. Slice your peppers lengthwise in half and remove seeds. I like to remove the extra bit of flesh around the edges, too, to have a larger "bowl" to stuff them in. I set aside those bits, chop them up and add them to my overall stove mixture/filling. On Medium heat, melt the butter. Add garlic, shallot, and onion. Now add your mushrooms and have them nice and brown. When that is starting to give you the right garlic/onion/shallot smell, add the chicken. If you want to cook the chicken separately, you are ok to do that. Combine chicken with your garlic/onion/shallot. Now add your seasonings and remaining pepper bits. Yummy! Cook it for a bit. I like to add about a half a cup of water at this point and turn my heat down low. Let simmer together for a little bit. Line your pan with a bit of olive oil. 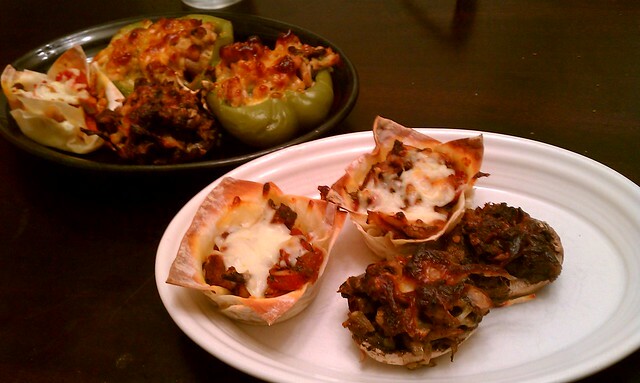 Lay your peppers flat and stuff with your filling. No really, stuff it really good! Cover your pan and cook for 35-40 minutes. Check on your peppers. Your oven temperature may vary. On medium heat, melt the butter. Add garlic, shallot, and onion. Next, add mushrooms and crumbled veggie patties. Add a half a cup of water and let simmer. Fill cleaned mushroom caps to the brim. Top with a bit of mozzerella and bake until cheese melts. I followed this recipe, which actually followed this recipe. Anyway, I went with it. I had some leftover meat and such from the stuffed green peppers, so I spiced it up with oregano and added my canned diced tomato. For me, because I'm doing the veggie thing, I filled them with my veggie sausage. Again, added oregano, a bit of red pepper flakes, mushrooms, onion, shallots, garlic. They were so good, Mari asked for this to be put on the regular rotation. She was particularly fond of the veggie ones. Interesting. Oh, and I did not soak the wontons. They crisped up quite nicely.